According to the Medinese model, which prefigures the use of later generations, a mosque is a place of worship, but also a place of knowledge and power . From these beginnings, she has retained her role in religious learning in its various forms. In particular, it was natural that copies of the Qur’an should be deposited there. But the sources also mention many other books, even entire libraries, preserved in mosques: it is clear how the needs of education, despite the importance of oral transmission, may have led to introducing to the medieval period works that we would say today “reference”. Such an approach had nothing casual: from an early period, lawyers have been concerned to define the legal status of volumes that could be so constituted waqf . The Maghreb is no exception to this use: the analysis in this respect of the cases of the Grand Mosque of Kairouan, Zaytûna of Tunis and Qarawiyyin in Fez shows that it was so in the Middle Ages. The information we have comes from various sources: chronicles, but also documentary sources more directly related to the books themselves. It undoubtedly brings to light the educational function of the latter but also invites us to question other roles they may have played in these mosques. The Grand Mosque of Kairouan, each of which is emblematic in the history of medieval Islam in North Africa, occupies a very exceptional position from this point of view. The history of his collection of manuscripts can indeed be studied both through those who have reached quite a number up to us and through an inventory established in 693/1294. At present, the Korans are only partially known, especially through exhibitions where the most beautiful pieces have found their place: this is particularly the case of the blue Quran, that said: “the Nanny” or even another, copied in gold ink at the rate of five lines on page . The bindings of these manuscripts, some of which were separated from the volumes they originally protected, were the subject of a careful publication by G. Marçais and L. Poinssot . Of a more modest appearance, legal manuscripts are of particular importance to those interested in Malikite doctrine and its history in the Maghreb. After the first report by O. Houdas , more specific studies was devoted to them by J. Schacht , then by Mr. Muranyi . The inventory provides a unique testimony of what could be in the Middle Ages the library of a mosque in a major city. It is a parchment book that originally had eleven pages of text on six sheets, as the editor pointed out towards the end; currently, there are only five sheets, the first, damaged, being used only on the back and preceding a gap corresponding to the second initial sheet, now disappeared. 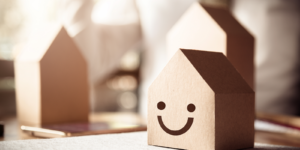 This document is not a catalog: it meets a legal requirement, related to this legal framework of mortmain property in favor of a mosque or a religious or charitable institution to which reference has been made upper. He is established in front of the Kairouan qâdï, Abu al-‘Abbâs Ahmad b. Isma’il al-Raba’i, in the presence of witnesses, and aims at presenting a precise state of the collection of books to each of which is devoted a more or less developed notice; it was not meant to be used by readers. The edition of the text procured by Ibrâhïm Chabbouh is accompanied only by a partial reproduction of the final page, with the date on which the operation was completed, the end of the month of Jumada II 693 / May 1294, and the signatures of the seven witnesses. The copyist seems to be the first of them, ‘Ali b. Husayn b. Ahmad al-Khalidin. Further information can be gleaned from the small book of Muhammad al-Nayyal on the Kairouan library: the final page is reproduced in full, as is the first page . On this one, whose upper right corner is lost, one notes that the text as it was published by I. Chabbouh was in fact preceded by an introduction of the same hand as the rest of the document and comprising at least three lines; only a few words remain, including snatches of a date -the name of the month and the tens of the year rabi I <.> 30, a date theoretically between 130 and 630 of the AH (747 and 1233 of the Christian era). What was it? Assuming that the hundreds digit is a 6 and that 630 should be read, the initial date would be 63 hegira to the completion of the inventory: this period of time allows the hypothesis to be rejected. a link to the pointing operation completed in 693/1294. On the other hand, the editor refers systematically to an earlier document which he calls sijill and which serves him at times as a point of comparison for establishing the state of certain manuscripts in the collection of the Grand Mosque. Moreover, he refers to it from the first occurrence on the first page by the expression al-sijill al-madkûr  11, which implies that he has already mentioned it a first time. In the mutilated part, it could be a question of this sijill that in the introduction, the stereotyped character of the following records making it unlikely the presence in one of them of this initial reference. If that were the case, the date on that spot could be the date of this document. Can we restore the number of hundreds missing? Records indicate three times copies that have been deposited in waqf by al-Suyûrî it is one of the great jurists Malikites of Kairouan at the time zïride, died in 462/1069 at the latest . It would be possible to read: 430/1038, but it seems a little early and difficult to reconcile with the presence in the fund of three works of al-Lakhmî who was a disciple of al-Suyûrîet died in 478/1085 after having left Kairouan the day after the Hilalian invasion . It seems to me, therefore, that the next century must be preferred, and I, therefore, suggest reading the date of Rabbi I 530 / December 1135. Was the sijill of 530/1135 an inventory of the same nature as that of 693/1294? The very frequency of the referrals made by the editor of the second document (he mentions it thirty-eight times) and the rather precise character of the data which he finds there seem to me to allow this supposition . The text of the inventory is presented continuously. It consists of successive records without a paragraph; the beginning of each description is however easily recognizable by the specific treatment reserved for the first word of the latter. Extensive elongation highlights it and allows the reader to conveniently find the beginning of descriptions. The writing is not the Maghreb: it is rather of Eastern type, with a tendency to multiply the ligatures. In its current state, the list contains 125 entries. The confrontation between the inventory and the collection as it currently stands confirms the first observations. The library brings together two sets that are clearly independent if not in their physical location (in the Middle Ages, they were grouped in the maqsûra), at least in their minds. The first is a ceremonial library, composed exclusively of Korans for which no expense has been spared parchment has been used with profusion and the gilding and the colors have a good place. Although summary, the description of the binding of mushafs refers to this elaborate type of bookbinding of which G. Marçais and L. Poinssot have published many examples ; quite consistently, the cover is in red leather this choice emphasizes the belonging of the volumes to the same collection and could also have aimed to exploit the royal symbolism related to this color . The second set is a study library where the practical side leads to privileging the form of the parchment booklet. The writing is small and gilding is absent with one exception . Overall, the writing medium is operated with a concern for the economy . The library inventoried in 693/1294 seems above all composed of copies deposited before the end of the 5th / 11th century; in any case, this is what the few non-Koranic manuscripts published to date  21 suggest (the publication of their catalog would allow a more detailed estimation of their chronology) and even more the Korans. Almost all these are copied in “Kufic” writing whose production, even admitting a certain conservatism Kairouan, does not exceed the beginning of the fifth/eleventh century . The sijill of 530/1135 found that Korans in several volumes were mismatched and thus suggested that it was already at that time old copies. 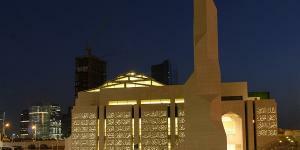 The majority of the preserved manuscripts were initially deposited in waqf in the library of the Grand Mosque. The editor of the inventory notes it five times for the Korans, ten times for the other works. As for the first ones, whose ostentatious character I have emphasized, few people had the necessary means to make this donation, especially for large format copies; so it is not surprising that several members of the ruling family of the Zirids are among the donors whose name appears in the act of waqf- or tahbish-transcribed on one or other of the preserved copies  . None of these names are in the inventory. It will be objected that this last does not correspond completely to the collection currently preserved at Raqqada and that the manuscripts of which it has just been mentioned do not necessarily appear there; however, I have elsewhere proposed to identify the famous Qur’an of the “Nurse” with No. 8 of the edition of I. Shabbhu about which there is no question of tahbish – while each volume carried one. The donors of the other manuscripts were men of religion whose involvement in the transmission of knowledge par excellence, of a religious nature, could represent for the editor of the inventory and the environment in which he was evolving a weighty element in the appreciation the value of these works. These were most likely used in the “study circles” (halqa) that formed in the great mosque around the teachers: this is suggested by the presence of certificates of hearing on a number of copies. They could still serve to the students in course of training, like exemplary for a copy . As much as the function of this part of the collection is defined with ease, so much does the role of the Korans demand to be clarified. It is obvious that they were not intended for learning that is done without recourse to the book. Nor are they destined for liturgical use since, as we know, the Muslim worship and especially the Friday prayer does not include a public reading of the Koran, thus distinguishing themselves from the practice of other “religions of the Book”. “. On the other hand, they could be used for a personal reading and, after all, acts of waqf of the third/ninth century, specify that copies made of mortmain are intended to be read . Assuming that the bulk of the inventory inventoried in 693/1294 was in place by the end of the 4th / 10th century, it then gathered nearly ninety Mushafs. However, most of these funds are actually series in several volumes: the inventory data can reach a total of 883 codicological units, to which were added the copies described on the missing sheet, bringing the total to more than a thousand. An equivalent number of readers could theoretically read at the same time a text of the Koran. Assessments of the population of Kairouan in the fourth/tenth century are unfortunately too mixed to allow an appreciation of the size of this library: they oscillate between 36 000 and 300 000 inhabitants , but in one case as in the other, the collection seems out of proportion to an actual need. Without going further into the question of the literacy of the Kairouan society of the time, it should be emphasized that these “Kufic” copies offered particular difficulties related to the type of writing and the vocalization system. It, therefore, appears that this large Koranic library was not used for reading or study, or only marginally. This accumulation of mushafs is explained by other reasons and in particular by the very function of its place of conservation. Because of the special place of the Great Mosque of Kairouan in the history of Maghreb Islam, the question arises whether the situation that has been described as an exception or if other examples confirm the diffusion of this type organization in the Maghreb. We do not currently have other medieval inventories of mosque libraries, assuming of course that they existed, but other sources might provide some answers. It is first of all the manuscripts themselves that could help us, but it would require that the catalogs include in the descriptions all the data relating to the history of the copies – which is far from being the case. The texts, especially the chronicles, keep us more directly exploitable information. In Fez, under the reign of the merinide Abu ‘Inan (reign of 749/1348 to 759/1359), the ruler founded a real library which an inscription keeps the memory. In this perspective, the absence in the inventory of 693/1294 of the names of people linked to political power seems deliberate; a more precise study of the manuscripts themselves may perhaps identify with some of the records those given by Zirides, but the case of the Qur’an of the Nanny, of which each of the sixty volumes apparently contained a waqf act. seems to be significant. 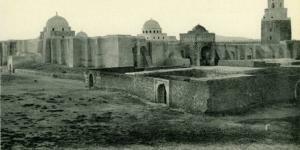 This silence is not limited to mushafs: al-Mu’izz b. Bâdïs also gave the Grand Mosque other copies, including fiqh texts, without his name appearing more in the inventory. The only explanation I will offer, and this is a hypothesis, is of a legal nature. In Malikite law, the waqf is valid only if the sums which made it possible to establish it were legally acquired by the donor. 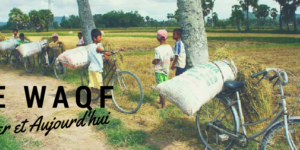 The editor – or the qadi – may have preferred to pass over in a legal document a point that could be discussed; on the other hand, it seems to admit that the awqaf of scholars or men of religion do not pose any difficulties. 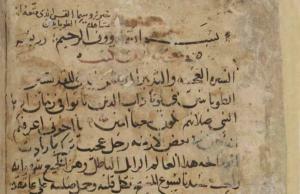 It is true that it is said about the jurist Kairouan al-Suyûrî, whose name appears in the inventory as a donor of several volumes, that he used more in the wake of the invasion hilâlienne that the parchment of employment or made from the skin of wild beasts, because the property of the herds that supplied the raw material to the parchment-makers had become suspect because of the troubles and confusion that prevailed. Perhaps the rigor that was expected of jurists – and most of the non-Koranic fund concerns them – explains that the editor of the inventory has more frequently noted the awqaf of his predecessors than those of the princes or their entourage. It can not be ruled out that the names of the former were of importance to him because they gave their guarantee to the transmission of knowledge. The scholarly library differs significantly from that of the Korans, particularly by its installation in a specific locality in Fez and Tunis in the 8th / 14th / 9th / 15th centuries; this physical differentiation could be the result of an evolution that was not yet initiated in Kairouan in the fifth / eleventh century when books were collected in the maqsùra. In large mosques, it is normal to find the well-represented “Koranic sciences” mentioned first in the enumerations of al-Jaznai and al-Zarkashi. In Kairouan, the legal aspect is numerically superior to exegesis; philology is curiously absent from the inventory, while manuscripts from Raqqada attest to its presence in Kairouan. I recalled above how these manuscripts were integrated into the teaching, either in the study circles or for the copy. Were the books lent? This possibility existed in Fez since al-Jaznâ’ï reports that Abû ‘Inân had appointed a loan registry official . Place of conservation of books and teaching organized around the book, a mosque is also a place of reading. This can be done by individuals, but I will be interested here in a phenomenon of public reading that seems characteristic of the mosques in the Middle Ages and whose sources have preserved the memory. The Korans of the big mosques did not remain in the chests where they were stored and from which they drew potential readers: it appears indeed that there was a passage from a “random” function to an integration from the book to a rite of reading in the enclosure of the mosque. By this I mean that the waqf acts of the 3rd / 9th century vaguely indicate the reading as the purpose of the waqf itself : this provision may have been intended to ensure the validity of the latter in the light of the law, not to actually give use to the manuscript. It should also be noted that while the recitation of the Koran in the mosque is well accepted by Malikite jurists, it should be done without the use of a mushaf according to the founder of the school . Subsequently, and although our documentation on this subject is much poorer than that which we have for Mamluk Egypt, it seems that reading rituals have been organized around Qur’anic manuscripts deposited in waqf in mosques of the Maghreb. The Maghrebian Korans in 30 volumes are certainly proportionally fewer than those known in the East, but they are not the indispensable accompaniment of these practices because, as we shall see, some of these are based on the former division of the Koran in seven parts. 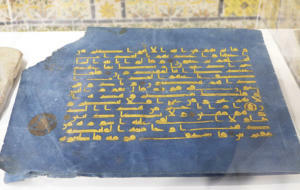 In the collection of al-Wansharis, two jurists mention hazzabun, in other words, readers of hizb who intervene in great mosques; the two texts correspond to decisions taken in the ninth / fifteenth century, in one case in Tlemcen , in the other in Fez , a sign of the success of this type of practice probably imitated from the East. It should be noted that, in the first, the distinction is made between the qâri ‘,’ reader ‘no doubt specialist in questions of recitation and variants, and the hazzabnn to whom is undoubtedly entrusted the task of reading / reciting a section. precise of the Koran. The chroniclers of the medieval period evoke the foundation by sovereigns of public readings: in Tunis, in the great mosque al-Zaytûna, the hafside Abu l-‘Abbâs Ahmad (reign of 772/1394 to 796/1394) instituted a daily reading of the seven parts of the Qur’an. In 868/1463, a large Koran was brought from Spain to Tunis and four readers were appointed the following year by Sultan Abu ‘Umar’ Uthman and were to perform their duties after the dawn prayers. noon and afternoon . 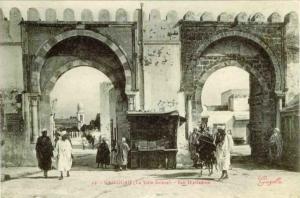 In the great mosque Qarawiyyin Fez, the halmoha Yûsuf b. ‘Abd al-Mu’min (reign of 558/1163 to 580/1184) decided to pay readers who intervened after the prayers of subh (dawn) and maghrib (sunset); according to al-Jaznai, he would have even extended this measure to his whole empire . A similar decision was taken by the Merinid Sultan Abu al-Hasan al-I (reign of 732/1331 to 749/1348) who planned to pay a remuneration (jamf) to ten readers in each of the mosques of his states . The uplifting public reading in medieval Maghreb mosques also touched on a wider range of texts than the Koran. In Fez, according to a ninth/fifteenth-century fatwa, the great mosque of Fâs al-Jadïd had a reader of unspecified works (qarï al-kutub), but probably religious content, next to the hazzabun . In Tunis, it is the Jami al-sahhh of Bukhari , the Kitab al-Shifa ft ta ‘rif huquq al-mustafa of Qdd’ Iyad  and the Kitab al-Targhfb wa-l-tarhfb of ‘Abd al-‘Azim al-Mundiri  who were read in the mosque al-Zaytûna as a result of a foundation of Abû Fâris’ Abd al-‘Azïz , while in Fès, at the merinide time they were edifying works that followed the Hizb of the Koran and met with such success that the Sultan instituted a remuneration for the reader of these texts . The mosques of Kairouan, Fez and Tunis which occupy a central place in the above analysis probably do not represent the most common situation in the Maghreb area. They illustrate the permanence of an ancient tradition, that of the “scholarly” library of mosques, which has been maintained despite the competition of specialized educational institutions such as the madrasa which appears in the Maghreb towards the middle of the 7th century. 13th century and which also has collections of books. The Quranic manuscripts, which we were entitled to expect to occupy a prominent place in mosques, have a specific status of which I have attempted to account; they are the privileged witnesses of the emergence of new attitudes that exploit their mediating character between materiality and the spiritual. They are also a relay in the development of these public readings that come to play an important role in the piety of medieval Islam in the Maghreb. Unfortunately, we have very little information on attendance at these sessions, which are also to be evaluated as manifestations of socialization in the Maghreb cities. Books, libraries and public readings of mosques are finally elements of the thorny issue of literacy companies in this region. Déroche François. Autour de l’inventaire médiéval de la bibliothèque de la mosquée de Kairouan : livres et mosquées au Maghreb. In: Lieux de cultes : aires votives, temples, églises, mosquées. IXe Colloque international sur l’histoire et l’archéologie de l’Afrique du Nord antique et médiévale (Tripoli, 19-25 février 2005) Préface de Jean-Luc Sibiude, ambassadeur de France en Libye. Paris : Éditions du Centre National de la Recherche Scientifique, 2008. pp. 247-255. El2, vol. VI, s.v. « masdjid ». L’envoi par le calife ‘Uthmân à différentes villes de l’empired’exemplaires du texte coranique qu’il avait fait établir est rapporté par nos sourcescelles-ci ne précisent cependant pas si les copies étaient déposées clans lamosquée de l’endroit. Par la suite, de nombreuses mosquées se targueront de posséder un «coran de ‘Uthmân >■ (voir par exemple l’article de I’. Buresi dans ce volume). Sur la question du waqf des livres, voir El2, vol. XI, s.v. «waqf», p. 67et 83; également Echk Y., Bibliothèques. 1967, p. 68-74, 368-378. Ces manuscrits qui ont été reproduits à de multiples reprises ont fait l’objet de notices plus ou moins détaillées T. Stanley a consacré récemment deux courtes études au coran bleu (The Qur’an and calligraphy, , p. 7- 15) et au coran avec cinq lignes à la page («the Qur’an on white vellum» ibid., p. 16-19) où figure une bibliographie. Sur le coran «de la Nourrice», voir Roy B. et Poinssot P., Inscriptions, 1950, p. 27-32 et fig. 7-8 Sam Fogg, Islamic calligraphy, [20031, p. 44-47, nos 20 et 21. Ces manuscrits et bien d’autres sont illustrés dans des catalogues d’expositions qui se sont tenues à Londres (Lings M. et Safadi Y.H., The Qur’an, 1976 The arts of Islam, 1976), Paris (De Carthage à Kairouan, 1982 Itinéraires du savoir, 1995) ou Lattes (Tunisie, Lattes, 2001). Marçais G. et Poinssot L., Objets kairouanais, 1948-52. Houdas O., Essai, 1886, p. 85-112. Schacht J., On some manuscripts, 1967, p. 225-258. Voir par exemple, parmi ses nombreuses publications Materialen, 1984 Fragment, 1985 Beitràge, 1997 Rechtsbùcher, 1999. Chabbouh I., Sijill, 1376/1956, p. 339-372. Également Gacek A., Ancient ‘sijill’, 1989, p. 26-29, et Voguf.t E., Inventaire, 2003, p. 532-544.
 ai.-nayyàl M., Maktaba, 1963, p. 13 (notice sur l’inventaire p. 12). Chabbouh I., Sijill, 1376/1956, p. 346, notice n” 8. Idris H.R., Crépuscule, 1956, p. 500; les manuscrits concernés portent dans l’édition de l’inventaire par I. Chabbouh les nos 76, 87, 110. Idris H.R., Crépuscule, 1956, p. 500-502 (I. Chabbouh donne 498/ 1104-1105 comme année de sa mort); il s’agit du n” 78 que Chabbouh rapproche d’une copie datée de 451/1059 qui est conservée dans la collection de Kairouan (Sijill, 1376/1956, p. 362, note 3) et des nos 79 et 116. Al-Lakhmï fut également le possesseur d’un manuscrit de cette même collection voir Schacht J., On some manuscripts, 1967, p. 247, n” 24 et note 8. D’après les déclarations d’al-Khâlidînî, il semble que le sijill comportait deux parties la première, qui s’étendait jusqu’au n”101 inclus représentait un ensemble cohérent auquel s’ajoutaient des notes qui, selon lui, figuraient – en bas » du document qu’il avait sous les yeux. Dans certains cas, des éléments disparates avaient dû au fil du temps être versés dans des boîtes c’est ce qui semble être arrivé pour le n” 47 (état ancien), formé de 77 «_/mz’» à partir desquels on reconstitue en 693/1294 les séries portant les n” 47 (nouvel état) à 53, sauf le n° 52 qui reste fait de morceaux d’origines diverses (voir Chabbouh I., Sijill, 1376/1956, p. 358). Voir plus haut. Sur ce type de reliure, voir Déroche Fr. et ai, Manuel, 2000, p. 282. Comme il est essentiellement associé à des volumes de format oblong, on peut penser que les corans décrits dans l’inventaire sont pour la plupart dans ce cas. Chabbouh I, Sijill, 1376/1956, p. 365-366, n°102 (copie orientale du Muwattâ’ de Mâlik b. Anas). Le ms Paris, BNF Arabe 6095, de 472/1079, qui pourrait provenir de Kairouan est composé de bifeuillets de parchemin qui sont découpés dans les parties proches des bords de la peau. Les plus anciens exemples datés de cahiers mixtes parchemin et papier sont kairouanais (voir Déroche Fr. et al., Manuel, 2000, p. 90, note 52). Un certain nombre d’entre eux comptent parmi les plus anciens manuscrits arabes datés: voir Déroche Fr., Manuscrits arabes datés, 1987- 1989, p. 347, nos 18 et 19, 348, nos 24 et 25, et 349, nos 30, 33 et 37. Les Zïrides ont encore déposé au début du ve/xie siècle des exemplaires en écriture dite «coufique» (voir ci-dessous). En revanche, le coran «de la Nourrice» relève du Nouveau Style. Sayyida Umm Malâl déposa un exemplaire au début du ve/xie siècle (De Carthage à Kairouan, 1982, p. 245, n” 328 Tunisie, 2001, p. 194, n” 113 et ill. p. 210 et 220), puis son neveu, le souverain zîride al-Mu’izz b. Bâdïs, fit de même postérieurement à sa rupture avec les Fâtimides entre 431/1041 et 441/1049-50 (Roy B. et Poinssot P., Inscriptions, 1950, p. 37-38, n” 10 et fig. 9; Rammah M., Semaine, 1995, p. 43; Itinéraire du savoir, 1995, p. 45). Voir Houdas O., Essai, 1886, p. 89-93 Schacht J., On some manuscripts, 1967, passim. Voir Houdas O., Essai, 1886, p. 89. Il est vrai que l’Occident musulman connaît, avec le Coran de ‘Uthmân, des ébauches de rites (voir la communication de P. Buresi), mais cela demeure bien circonscrit. 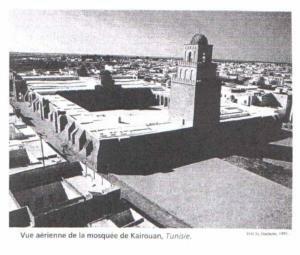 Sakly M., Kairouan, 2000, p. 61 (citant A. Lézine et M. Talbi). El- Djaznâî, Zahrat el-Âs, p. 68-69 (arabe) et 148-150 (trad.). Voir Binebine A., Histoire des bibliothèques, 1992, p. 91-93- El- Djaznâl, Zahrat el-Âs, p. 149. Arabe 423, voir Déroche Fr., Catalogue, 1985, p. 32, n° 297 et pi. II A.
 Al-Zarkashï, Ta’rfkh al-dawlatayn, p. 235 et 250, 270 et 286. Comme le souligne R. Brunschvig, Abu Fâris chercha pendant son règne à se concilier les hommes de religion (Berbérie orientale I, 1941, p. 215). Déroche Fr., Catalogue, 1985, p. 36-37, nos 305-308 et pi. Ill B et IX A.
 Roy B. et Poinssot P., Inscriptions, 1950, p. 37-38, n° 10 et fig. 9; Rammah M., Semaine, 1995, p. 43 (dans la notice en français). Abd al-WahhÀb H.H., ‘Inâya bi-1-kutub, 1955, p. 87-88; B. Roy et P. Poinssot reproduisent le texte qui figure sur un exemplaire de la Mudawwana (Inscriptions, 1950, p. 36-37, n” 9 sext.). Opinion mentionnée dans al-Wansharïsï (voir Lagardère V., Histoire et société, 1995, p. 124). Également dans Idris H.R., Crépuscule, 1956, p. 496. Eché Y., Bibliothèques, 1967, p. 344. El-Djaznâï, Zahrat el-Âs, p. 149. Fierro M., Treatises against innovations, 1992, p. 214 et 216.Également Lagardère V., Histoire et société, 1995, p. 49. Lagardère V., Histoire et société, 1995, p. 227. Lagardère V., Histoire et société, 1995, p. 239. Al-Zarkashî, Ta’rtkh al-dawlatayn, p. 218. El-Djaznâï, Zahrat el-Às, p. 159. Plus haut, l’auteur a évoqué lafondation par le mérinide Abu ‘Inân d’une récitation du Coran dans lazâwiya al-qurrâ’ de la mosquée Qarawiyyïn (p. 151). Lagardère V., Histoire et société, 1995, p. 239- Dans ce recueil, on trouve un texte émanant d’un juriste grenadin de la même époque qui reconnaît que la lecture à haute voix d’ouvrages d’exhortation est recommandable, mais condamne certains livres, tenus pour néfastes (p. 277). Brockelmann C, Geschichte I, 1943, p. 163-164. Brockelmann C, Geschichte I, 1943, p. 455. Brockelmann C, Geschichte I, 1943, p. 452. Al-Zarkashï, Ta’rikh al-dawlatayn, p. 235. According to the Medinese model, which prefigures the use of later generations, the mosque is a place of worship, but also a place of knowledge and power . From these beginnings, she has retained her role in religious learning in its various forms. In particular, it was natural that copies of the Qur’an should be deposited there. But the sources also mention many other books, even entire libraries, preserved in mosques: it is clear how the needs of education, despite the importance of oral transmission, may have led to introduce to the medieval period works that we would say today “reference”. Such an approach had nothing casual: from an early period, lawyers have been concerned to define the legal status of volumes that could be so constituted waqf . The Maghreb is no exception to this use: the analysis in this respect of the cases of the Grand Mosque of Kairouan, Zaytûna of Tunis and Qarawiyyin in Fez shows that it was so in the Middle Ages. The information we have comes from various sources: chronicles, but also documentary sources more directly related to the books themselves. It undoubtedly brings to light the educational function of the latter, but also invites us to question other roles they may have played in these mosques. At present, the Korans are only partially known, especially through exhibitions where the most beautiful pieces have found their place: this is particularly the case of the blue quran, that said “the Nanny” or even another, copied in gold ink at the rate of five lines on page . D’apparence plus modeste, les manuscrits juridiques ont une importance particulière pour ceux qui s’intéressent à la doctrine malikite et à son histoire au Maghreb. Après un premier signalement par O. Houdas, des études plus spécifiques leur ont été consacrées par J. Schacht, puis par M. Muranyi. L’inventaire fournit quant à lui un témoignage unique sur ce que pouvait être au Moyen Âge la bibliothèque d’une mosquée d’une ville importante. Il s’agit d’un cahier de parchemin qui comportait à l’origine onze pages de texte sur six feuillets, comme le précise le rédacteur vers la fin ; actuellement, il ne compte plus que cinq feuillets, le premier, endommagé, n’étant utilisé qu’au verso et précédant une lacune correspondant au second feuillet initial, maintenant disparu. Ce document n’est pas un catalogue : il répond à une exigence d’ordre juridique, liée à cet encadrement légal des biens de mainmorte en faveur d’une mosquée ou d’un établissement à caractère religieux ou caritatif auquel il a été fait allusion plus haut. Il est établi devant le qâdï de Kairouan, Abu al-‘Abbâs Ahmad b. Ismâ’ïl al-Raba’î, en présence de témoins et vise à présenter un état précis de la collection de livres à chacun desquels est consacré une notice plus ou moins développée ; il n’était pas destiné en revanche à être utilisé par des lecteurs. L’édition du texte procurée par Ibrâhïm Chabbouh n’est accompagnée que d’une reproduction partielle de la page finale, avec la date à laquelle a été achevée l’opération, la fin du mois de jumâdâ II 693/mai 1294, et les signatures des sept témoins. Le copiste semble être le premier d’entre eux, ‘Alï b. Husayn b. Ahmad al-Khâlidïnï. Un complément d’information peut être glané dans le petit livre de Muhammad al-Nayyâl sur la bibliothèque de Kairouan : la page finale y est intégralement reproduite, de même que la première. Sur celle-ci, dont le coin supérieur droit est perdu, on constate que le texte tel qu’il a été publié par I. Chabbouh était en fait précédé d’une introduction de la même main que le reste du document et comportant au moins trois lignes; il n’en subsiste que quelques mots, notamment des bribes d’une date –le nom du mois et les dizaines de l’année rabi I <.>30, soit une date comprise théoriquement entre 130 et 630 de l’hégire (747 et 1233 de l’ère chrétienne). À quoi correspondait-elle ? En supposant que le chiffre des centaines soit un 6 et qu’il faille lire 630, la date initiale serait antérieure de 63 années hégiriennes à celle de l’achèvement de l’inventaire : ce laps de temps autorise à écarter l’hypothèse d’un lien avec l’opération de pointage achevée en 693/1294. En revanche, le rédacteur se réfère de manière systématique à un document antérieur qu’il appelle sijill et qui lui sert par moments de point de comparaison pour établir l’état de certains manuscrits de la collection de la grande mosquée. Bien plus, il le désigne dès la première occurrence sur la première page par l’expression al-sijill al-madkûr11, ce qui implique qu’il l’a déjà mentionné une première fois. Dans la partie mutilée, il ne pouvait être question de ce sijill que dans l’introduction, le caractère stéréotypé des notices qui suivent rendant peu vraisemblable la présence dans l’une d’elles de cette référence initiale. S’il en était bien ainsi, la date figurant à cet endroit pourrait être celle de ce document. Peut-on restituer le chiffre des centaines manquant ? Des notices signalent à trois reprises des exemplaires qui ont été déposés en waqf par al-Suyûrî il s’agit de l’un des grands juristes malikites de Kairouan à l’époque zïride, mort en 462/1069 au plus tard12. Il serait donc possible de lire : 430/1038, mais cela paraît un peu tôt et difficile à concilier avec la présence dans le fonds de trois œuvres d’al-Lakhmî qui fut un disciple d’al-Suyûrîet mourut en 478/1085 après avoir quitté Kairouan au lendemain de l’invasion hilâlienne. Il me semble donc qu’il faut préférer le siècle suivant et je suggère donc de lire la date de rabf I 530/décembre 1135. Le sijill de 530/1135 était-il un inventaire de même nature que celui de 693/1294? La fréquence même des renvois que fait le rédacteur du deuxième document (il le mentionne à trente-huit reprises) et le caractère assez précis des données qu’il y trouve me paraissent autoriser cette supposition. Le texte de l’inventaire se présente de manière continue. Il est constitué de notices qui se succèdent sans alinéa ; le début de chaque description est toutefois aisément reconnaissable par le traitement spécifique réservé au premier mot de celle-ci. Une ample élongation le met en évidence et permet ainsi au lecteur de retrouver commodément le commencement des descriptions. L’écriture n’est pas maghrébine : elle est plutôt de type oriental, avec une tendance à multiplier les ligatures. Dans son état actuel, la liste contient 125 entrées. Si nous faisons l’hypothèse que l’organisation du document originel était cohérente, il nous est possible d’évaluer le nombre des descriptions qui figuraient sur le feuillet disparu en effet, la première partie de l’inventaire actuel (les numéros 1 à 57 de Chabbouh, jusqu’au f. 5) est entièrement consacrée aux corans et un renvoi interne dans la notice n° 57 confirme qu’un coran était bien décrit à la page 3, aujourd’hui disparue. En se fondant sur l’espace occupé par les descriptions de ces manuscrits, on peut estimer à vingt ou vingt-cinq celles qui manquent maintenant. Cela signifie que l’inventaire comportait à l’origine de 145 à 150 notices, dont 90 environ (67 effectivement présentes, plus 20 à 25 sur le feuillet disparu) concernent les corans, soit près des deux tiers. Je reviendrai plus loin sur le sens de la présence d’une proportion aussi considérable de copies d’un même texte. Les notices consacrées aux manuscrits coraniques ou mushafs de la bibliothèque de la grande mosquée précisent généralement s’il s’agissait d’un volume unique ou d’un coran en plusieurs tomes : parmi les 67 entrées, trois seulement correspondent clairement au premier cas. Les autres sont principalement des versions en 30juz’ (elles sont 17) qui devancent de peu celles en 14 (12 cas) et en 7 (6 cas) tomes, les unes et les autres relevant d’ailleurs de la même logique. En guise de titre, le rédacteur emploie volontiers la périphrase al-kitâb al-‘aztz, «le Livre vénérable ». Il indique ensuite de manière relativement régulière la variété d’encre, les couleurs employées pour les signes vocaliques, le nombre de lignes, la présence d’enluminures et leur emplacement, le support (papier ou parchemin), le type d’écriture, la reliure et les matériaux utilisés pour la confectionner et, éventuellement, l’existence d’une boîte dans laquelle ces corans sont conservés. Le contraste est fort avec les autres manuscrits. La description que donne le rédacteur est beaucoup plus succincte elle comprend le titre et éventuellement le nom de l’auteur, la présence d’un acte de waqf et une indication d’ensemble sur la présentation matérielle. Pour la plupart d’entre eux, ces manuscrits se présentent non pas sous la forme d’un codex relié, mais sous celle de fascicules (daftar ou juz’) indépendants, copiés sur du parchemin ou sur du papier. Un classement des manuscrits en fonction de leur sujet fait ressortir l’orientation juridique de cette collection elle réunit quarante-cinq ouvrages de fiqh et n’en compte que trois de hadït et autant d’exégèse. Dans 17% des cas, le rédacteur signale un waqf “(ou tahbïs pour reprendre sa terminologie), alors qu’il ne le fait que pour 7% des corans. La confrontation entre l’inventaire et la collection telle qu’elle se présente actuellement permet de confirmer les premières observations. La bibliothèque réunit deux ensembles qui sont clairement indépendants sinon dans leur emplacement physique (au Moyen Age, ils étaient regroupés dans la maqsûra), du moins dans leur esprit. Le premier est une bibliothèque d’apparat, composée exclusivement de corans pour lesquels aucune dépense n’a été épargnée le parchemin a été utilisé avec profusion et la dorure et les couleurs y tiennent une bonne place. Bien que sommaire, la description des reliures des mushafs renvoie à ce type élaboré de reliure-coffret dont G. Marçais et L. Poinssot ont publié maints exemples ; assez systématiquement, la couvrure est en cuir rouge ce choix souligne l’appartenance des volumes à une même collection et pourrait également avoir visé à exploiter la symbolique royale liée à cette couleur. Le second ensemble est une bibliothèque d’étude où le côté pratique conduit à privilégier la forme du fascicule de parchemin. L’écriture est de petite taille et la dorure est absente à une exception près. Globalement, le support d’écriture est exploité avec un souci d’économie. La bibliothèque inventoriée en 693/1294 semble avant tout composée de copies déposées avant la fin du Ve/XIe siècle ; c’est en tout cas ce que suggèrent les quelques manuscrits non-coraniques publiés à ce jour21 (la publication de leur catalogue permettrait une estimation plus fine de leur chronologie) et plus encore les corans. Presque tous ces derniers sont copiés en écriture « coufique » dont la production, même en admettant un certain conservatisme kairouanais, ne dépasse pas le début du Ve/XIe siècle. Le sijill de 530/1135 constatait que des corans en plusieurs tomes étaient dépareillés et suggérait ainsi qu’il s’agissait déjà à ce moment d’exemplaires anciens. The donors of the other manuscripts were men of religion whose involvement in the transmission of knowledge par excellence, of a religious nature, could represent for the editor of the inventory and the environment in which he was evolving a weighty element in the appreciation the value of these works. These were most likely used in the “study circles” (halqa) that formed in the great mosque around the teachers: this is suggested by the presence of certificates of hearing on a number of copies. They could still serve to the students in course of training, like exemplar for a copy . As much as the function of this part of the collection is defined with ease, so much does the role of the Korans demand to be clarified. It is obvious that they were not intended for learning that is done without recourse to the book. Nor are they destined for liturgical use since, as we know, the Muslim worship and especially the Friday prayer do not include a public reading of the Koran, thus distinguishing themselves from the practice of other “religions of the Book”. “. On the other hand, they could be used for a personal reading and, after all, acts of waqf of the third / ninth century, specify that copies made of mortmain are intended to be read . Assuming that the bulk of the inventory inventoried in 693/1294 was in place by the end of the 4th / 10th century, it then gathered nearly ninety Mushafs. However, most of these funds are actually series in several volumes: the inventory data can reach a total of 883 codicological units, to which were added the copies described on the missing sheet, bringing the total to more than a thousand. An equivalent number of readers could theoretically read at the same time a text of the Koran. Assessments of the population of Kairouan in the fourth / tenth century are unfortunately too mixed to allow an appreciation of the size of this libeca coranica: they oscillate between 36 000 and 300 000 inhabitants , but in one case as in the other, the collection seems out of proportion to an actual need. Without going further into the question of the literacy of the Kairouan society of the time, it should be emphasized that these “Kufic” copies offered particular difficulties related to the type of writing and the vocalization system. It therefore appears that this large Koranic library was not used for reading or study, or only marginally. This accumulation of mushafs is explained by other reasons and in particular by the very function of its place of conservation. Because of the special place of the Great Mosque of Kairouan in the history of Maghreb Islam, the question arises whether the situation that has been described was an exception or if other examples confirm the diffusion of this type organization in the Maghreb. In this perspective, the absence in the inventory of 693/1294 of the names of people linked to political power seems deliberate; a more precise study of the manuscripts themselves may perhaps identify with some of the records those given by Zirides, but the case of the Qur’an of the Nanny, of which each of the sixty volumes apparently contained a waqf act. seems to me significant. This silence is not limited to mushafs: al-Mu’izz b. Bâdïs also gave the Grand Mosque other copies, including fiqh texts, without his name appearing more in the inventory. The only explanation I will offer, and this is a hypothesis, is of a legal nature. In Malikite law, the waqf is valid only if the sums which made it possible to establish it were legally acquired by the donor. The editor – or the qddi – may have preferred to pass over in a legal document a point that could be discussed; on the other hand, it seems to admit that the awqafs of scholars or men of religion do not pose any difficulties. Place of conservation of books and teaching organized around the book, the mosque is also a place of reading. This can be done by individuals, but I will be interested here in a phenomenon of public reading that seems characteristic of the mosques in the Middle Ages and whose sources have preserved the memory. The Korans of the big mosques did not remain in the chests where they were stored and from which they drew potential readers: it appears indeed that there was a passage from a “random” function to an integration from the book to a rite of reading in the enclosure of the mosque. By this I mean that the waqf acts of the 3rd / 9th century vaguely indicate the reading as the purpose of the waqf itself : this provision may have been intended to ensure the validity of the latter in the light of the law, not to actually give use to the manuscript. 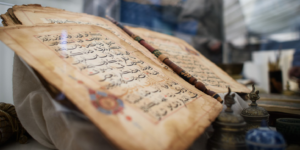 Subsequently, and although our documentation on this subject is much poorer than that which we have for Mamluk Egypt, it seems that reading rituals have been organized around Qur’anic manuscripts deposited in waqf in mosques of the Maghreb. . The Maghrebian Korans in 30 volumes are certainly proportionally fewer than those known in the East, but they are not the indispensable accompaniment of these practices because, as we shall see, some of these are based on the former division of the Koran in seven parts. A similar decision was taken by the Merinid Sultan Abu al-Hasan al-I (reign of 732/1331 to 749/1348) who planned to pay a remuneration (jamf) to ten readers in each of the mosques of his states  . The uplifting public reading in medieval Maghreb mosques also touched on a wider range of texts than the Koran. In Fez, according to a ninth / fifteenth century fatwa, the great mosque of Fâs al-Jadïd had a reader of unspecified works (qarï al-kutub), but probably religious content, next to the hazzabun . In Tunis, it is the Jami al-sahhh of Bukhari , the Kitab al-Shifa ft ta ‘rif huquq al-mustafa of Qdd’ Iyad  and the Kitab al-Targhfb wa-l-tarhfb of ‘Abd al-‘Azim al-Mundiri  who were read in the mosque al-Zaytûna as a result of a foundation of Abû Fâris’ Abd al-‘Azïz , while in Fès, at the merinid time they were edifying works that followed the hizb of the Koran and met with such success that the Sultan instituted a remuneration for the reader of these texts . Les mosquées de Kairouan, Fès et Tunis qui tiennent une place centrale dans l’analyse qui précède ne représentent sans doute pas la situation la plus commune dans l’espace maghrébin. Elles illustrent la permanence d’une tradition ancienne, celle de la bibliothèque «savante» des mosquées, qui s’est maintenue en dépit de la concurrence d’établissements spécialisés d’enseignement comme la madrasa qui apparaît au Maghreb vers le milieu du VIIe/XIIIe siècle et qui dispose également de collections de livres. Les manuscrits coraniques, dont on était en droit d’attendre qu’ils occupassent une place de choix dans les mosquées, ont un statut spécifique dont j’ai tenté de rendre compte ; ils sont les témoins privilégiés de l’émergence d’attitudes nouvelles qui exploitent leur caractère de médiateur entre la matérialité et le spirituel. 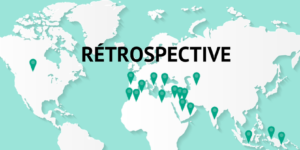 Ils constituent en outre un relais dans le développement de ces lectures publiques qui en viennent à jouer un rôle important dans la piété de l’islam médiéval au Maghreb. Nous ne disposons malheureusement que de maigres indications sur la fréquentation de ces séances qui sont à évaluer également comme des manifestations de la socialisation dans les cités maghrébines. Livres, bibliothèques et lectures publiques des mosquées sont enfin des éléments de l’épineuse question de l’alphabétisation des sociétés de cette région. Of a more modest appearance, legal manuscripts are of particular importance to those interested in Malikite doctrine and its history in the Maghreb. After a first report by O. Houdas , more specific studies were devoted to them by J. Schacht , then by Mr. Muranyi . Dans leur majorité, les manuscrits conservés avaient été initialement déposés en waqf dans la bibliothèque de la grande mosquée. Le rédacteur de l’inventaire le note à cinq reprises pour les corans, à dix reprises pour les autres ouvrages. En ce qui concerne les premiers, dont j’ai souligné le caractère volontiers fastueux, peu de personnes disposaient des moyens nécessaires pour réaliser ce don, notamment pour les exemplaires de grand format ; aussi n’est-il pas surprenant que plusieurs membres de la famille régnante des Zïrides figurent parmi les donateurs dont le nom apparaît dans l’acte de waqf- ou tahbïs – transcrit sur l’une ou l’autre des copies conservées. Or aucun de ces noms ne figure dans l’inventaire. On objectera que ce dernier ne correspond pas complètement à la collection actuellement conservée à Raqqâda et que les manuscrits dont il vient d’être question n’y figurent pas forcément; j’ai toutefois proposé ailleurs d’identifier le célèbre coran «de la Nourrice» avec le n° 8 de l’édition d’I. Chabbouh à propos duquel il n’est pas question de tahbïs – alors que chaque volume en portait un. Les donateurs des autres manuscrits étaient des hommes de religion dont l’implication dans la transmission du savoir par excellence, de nature religieuse, pouvait représenter pour le rédacteur de l’inventaire et le milieu dans lequel il évoluait une donnée de poids dans l’appréciation de la valeur de ces ouvrages. Ceux-ci étaient employés selon toute vraisemblance dans les «cercles d’étude» (halqa) qui se formaient dans la grande mosquée autour des professeurs : c’est ce que laisse penser la présence de certificats d’audition sur un certain nombre d’exemplaires. Ils pouvaient encore servir aux étudiants en cours d’apprentissage, comme exemplar pour une copie. Autant la fonction de cette partie de la collection se définit avec facilité, autant le rôle des corans demande-t-il à être précisé. Il est évident qu’ils n’étaient pas destinés à l’apprentissage qui se fait sans recours au livre. Ils ne sont pas davantage destinés à un usage liturgique puisque, comme on sait, le culte musulman et plus spécialement la prière du vendredi ne comportent pas de lecture publique du Coran, se distinguant ainsi de la pratique des autres «religions du Livre». Ils pouvaient en revanche servir à une lecture personnelle et, après tout, des actes de waqf du IIIe/IXe siècle, spécifient que les copies constituées bien de mainmorte ont pour vocation d’être lues. En faisant l’hypothèse que l’essentiel de la collection inventoriée en 693/1294 était en place vers la fin du IVe/Xe siècle, elle réunissait alors près de quatre-vingt-dix mushafs. Or la plupart de ces deniers sont en fait des séries en plusieurs volumes : les données de l’inventaire permettent d’atteindre un total de 883 unités codicologiques, à quoi s’ajoutaient les copies décrites sur le feuillet disparu, ce qui porte le total à plus de mille. Un nombre équivalent de lecteurs pouvaient donc théoriquement lire au même moment un texte du Coran. Les évaluations de la population de Kairouan au IVe/Xe siècle sont malheureusement trop contrastées pour autoriser une appréciation de la taille de cette bibliotheca coranica : elles oscillent en effet entre 36 000 et 300 000 habitants, mais dans un cas comme dans l’autre, la collection paraît hors de proportion avec un besoin effectif. Sans entrer de surcroît dans la question de l’alphabétisation de la société kairouanaise de l’époque, il convient de souligner que ces copies « coufiques » offraient des difficultés particulières liées au type d’écriture et au système de vocalisation. Il apparaît donc que cette grosse bibliothèque coranique ne servait pas pour la lecture ou l’étude, ou seulement de manière marginale. Cette accumulation de mushafs s’explique par d’autres raisons et notamment par la fonction même de son lieu de conservation. 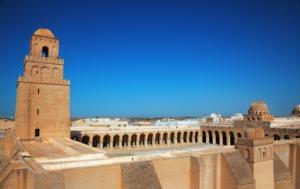 En raison de la place particulière de la grande mosquée de Kairouan dans l’histoire de l’islam maghrébin, la question se pose de savoir si la situation qui a été décrite représentait une exception ou si d’autres exemples confirment la diffusion de ce type d’organisation au Maghreb. Nous ne disposons pas actuellement d’autres inventaires médiévaux de bibliothèques de mosquées, à supposer bien sûr qu’ils aient existé, mais d’autres sources pourraient fournir quelques éléments de réponse. Ce sont tout d’abord les manuscrits eux-mêmes qui pourraient nous aider, mais il faudrait pour cela que les catalogues incluent dans les descriptions toutes les données relatives à l’histoire des copies – ce qui est loin d’être le cas. Les textes, en particulier des chroniques, nous conservent des informations plus directement exploitables. À Fès, sous le règne du mérinide Abu ‘Inân (règne de 749/1348 à 759/1359), le souverain fonda une véritable bibliothèque dont une inscription conserve le souvenir. Dans son Zahrat al-âs, al-Jaznâ’ï donne un récit relativement détaillé de cet épisode dans lequel il inclut une description qui fait clairement apparaître qu’il s’agissait en fait de deux collections séparées, l’une destinée aux enseignants ou étudiants qui, dans la meilleure tradition, prenaient place dans l’enceinte de la mosquée pour transmettre ou acquérir un savoir, l’autre étant la bibliothèque des corans (khizânat al-masâhif), au sud de la mosquée, qui était accessible aux fidèles qui souhaitaient lire le texte révélé. Ainsi que nous avions pu l’observer à Kairouan, les manuscrits qui composaient la seconde se signalaient par leur beauté et leur opulence ; ils furent constitués waqf par le souverain selon les termes d’un acte dont al-Jaznâ’ï semble donner copie et qui figurait sans doute sur chaque volume. Les données chiffrées manquent qui auraient permis d’établir une comparaison avec Kairouan ; le chroniqueur se borne à indiquer qu’il y avait là « un nombre important d’exemplaires d’une belle écriture, embellis d’enluminures, précieux et riches ». La Bibliothèque nationale de France conserve d’ailleurs un tome d’un coran en huit parties dont les caractéristiques (belle écriture, enluminure) coïncident bien avec cette description ; malheureusement, l’acte très effacé ne semble pas comporter l’indication du nom de la mosquée en faveur de laquelle Abu ‘Inân avait établi le waqf. À Tunis, les hafsides Abu Fâris ‘Abd al-‘Azïz al-Mutawakkil (règne de 796/1394 à 837/1434) et Abu ‘Umar ‘Uthmân (règne de 839/1435 à 893/1488) ont fait édifier dans l’enceinte de la mosquée al-Zaytûna de Tunis des bibliothèques où ils avaient déposé en waqf un certain nombre de livres, comme le rapporte al-Zarkashï. Ces ouvrages, ajoute-t-il, traitaient de la loi musulmane, de langue, de médecine, de calcul, d’histoire et de belles lettres ; le Coran ne figure pas dans son énumération. Il ne faut cependant pas se hâter de conclure que ces souverains n’ont pas offert de mushafs à des mosquées : le nom d’Abû Fâris apparaît en effet dans l’acte qui est placé au début du fameux coran pourpre en cinq volumes conservé de nos jours à la Bibliothèque nationale de France (Arabe 389 à 392) et à la Bibliothèque nationale de Russie à Saint-Pétersbourg. Il est vrai que la mosquée bénéficiaire est celle de la Qasba, à Tunis, mais le luxe de ce manuscrit ne le cède en rien à ses prédécesseurs kairouanais, tant pour l’écriture que pour la reliure. Je signalerai pour mémoire un autre coran de belle facture, conservé lui aussi à la BNF (Arabe 388) et datable du VIIIe/XIVe siècle, dont l’acte de waqf, quoique partiellement effacé, montre qu’il faisait partie du fonds de la Zaytûna. Si la chronique d’al-Zarkashï ne contient pas les éléments qui permettraient d’identifier une situation similaire à celle de Kairouan et de Fès, elle nous présente néanmoins le tableau de deux bibliothèques réunissant des ouvrages touchant à différents domaines du savoir. Les manuscrits du Coran étaient-ils conservés en un autre endroit ? Ils existaient en tout cas, comme le montrent les deux manuscrits coraniques que j’ai signalés. L’inventaire médiéval de la bibliothèque de la grande mosquée de Kairouan, de même que les chroniques, introduit une claire distinction entre les ouvrages scientifiques, traités de manière expéditive parce qu’utilitaires, et les corans qui ne peuvent être conçus que comme des manuscrits précieux. La fonction de ces derniers paraît relever davantage du domaine de la symbolique que de celui de l’utilité puisque, comme je l’ai rappelé, ils ne sont pas intégrés à une liturgie, ni à un enseignement. Le coran est cependant à sa place dans la mosquée en tant qu’image de la parole révélée dont il assure la présence réelle. Cette réification du verbe divin peut permettre une forme d’instrumentalisation par le pouvoir politique qui a traditionnellement sa place dans la grande mosquée : devant la communauté réunie, le nom du souverain était prononcé au cours de la khutba – l’allocution rituelle qui, le vendredi, précède la prière proprement dite. Les manuscrits du Coran et a fortiori les bibliothèques offrent une possibilité de médiation : l’acte de waqf associe le nom du prince à une œuvre pieuse sous le regard de la communauté dans ce lieu hautement significatif qu’est la mosquée. Il peut même se combiner avec une autre fonction, par exemple politique, lorsqu’une déclaration y est intégrée: le zîride Mu’izz b. Bâdïs a tracé de sa main le tahbïs d’un coran déposé dans la mosquée de Kairouan où il inséra une malédiction de la dynastie fatimide, déclarant ainsi son ralliement à l’orthodoxie sunnite. Le zèle d’Abû ‘Inân à constituer en waqf des exemplaires du Coran n’est peut-être pas sans rapport avec la position d’usurpateur vis-à-vis de son père qui fut la sienne au début de son règne. Dans cette perspective, l’absence dans l’inventaire de 693/1294 des noms des personnes liées au pouvoir politique semble délibérée ; une étude plus précise des manuscrits eux-mêmes permettra peut-être d’identifier avec certaines des notices ceux qui ont été donnés par des Zïrides, mais le cas du coran « de la Nourrice » dont chacun des soixante volumes comportait apparemment un acte de waqf me paraît significatif. Ce silence ne se limite pas aux mushafs : al-Mu’izz b. Bâdïs a également donné à la grande mosquée d’autres copies, notamment de textes de fiqh, sans que son nom apparaisse davantage dans l’inventaire. La seule explication que je proposerai, et il s’agit d’une hypothèse, est de nature juridique. En droit malikite, le waqf n’est valide que si les sommes qui ont permis de l’instituer ont été légalement acquises par le donateur. Le rédacteur -ou le qâdï- a pu préférer passer sous silence dans un document légal un point qui pouvait faire discussion ; en revanche, il semble admettre que les awqaf des savants ou hommes de religion ne posent pas de difficultés. Il est vrai qu’on raconte à propos du juriste kairouanais al-Suyûrî, dont le nom apparaît dans l’inventaire comme donateur de plusieurs volumes, qu’il n’utilisait plus à la suite de l’invasion hilâlienne que du parchemin de remploi ou fait à partir de la peau de bêtes sauvages, car la propriété des troupeaux qui fournissaient la matière première aux parcheminiers était devenue suspecte en raison des troubles et de la confusion qui régnaient. Peut-être cette rigueur que l’on était en droit d’attendre de la part de juristes – et l’essentiel du fonds non coranique les concerne – explique que le rédacteur de l’inventaire ait plus fréquemment relevé les awqaf de ses devanciers que ceux des princes ou de leur entourage. On ne peut exclure également que les noms des premiers aient revêtu à ses yeux une importance parce qu’ils apportaient leur caution à la transmission du savoir. La bibliothèque érudite diffère sensiblement de celle des corans, en particulier par son installation dans un local spécifique à Fès et à Tunis aux VIIIe/XIVe IXe/ XVe siècles ; cette différenciation physique pourrait être le résultat d’une évolution qui n’était pas encore engagée à Kairouan au Ve/XIe siècle où les livres étaient rassemblés dans la maqsùra. Dans les grandes mosquées, il est normal de retrouver les «sciences coraniques» bien représentées -et mentionnées en premier dans les énumérations d’al-Jaznâ’ï et d’al-Zarkashî. À Kairouan, l’aspect juridique l’emporte numériquement sur l’exégèse ; la philologie est curieusement absente de l’inventaire, alors que des manuscrits de Raqqâda attestent qu’elle était bien présente à Kairouan. À Fès et à Tunis, presque à la même époque, le choix du souverain (ou de son entourage) touche des domaines comme la littérature, les mathématiques ou la médecine : cette situation contraste avec celle que Yusuf Eché pensait identifier en Orient où les sciences religieuses auraient fini par l’emporter dans les bibliothèques publiques médiévales qu’il avait étudiées. J’ai rappelé plus haut comment ces manuscrits étaient intégrés à l’enseignement, soit dans les cercles d’études, soit pour la copie. Les ouvrages étaient-ils prêtés ? Cette possibilité existait à Fès puisque al-Jaznâ’ï rapporte qu’Abû ‘Inân avait nommé un responsable du registre des prêts. Lieu de conservation des livres et d’enseignement organisé autour du livre, la mosquée est également un lieu de lecture. Celle-ci peut être le fait d’individus, mais je m’intéresserai ici à un phénomène de lecture publique qui paraît caractéristique des mosquées au Moyen Âge et dont les sources nous ont conservé le souvenir. Les corans des grandes mosquées ne sont en effet pas restés dans les coffres où ils étaient rangés et d’où les tiraient d’éventuels lecteurs : il apparaît en effet qu’il y a eu passage d’une fonction «aléatoire» à une intégration du livre à un rite de lecture dans l’enceinte de la mosquée. Je veux dire par là que les actes de waqf du IIIe/IXe siècle indiquent de manière vague la lecture comme finalité du waqf lui-même : cette disposition peut avoir eu pour objet d’assurer la validité de ce dernier au regard de la loi, non de donner effectivement un usage au manuscrit. Il faut d’ailleurs relever que si la récitation du Coran dans la mosquée est bien admise par les juristes malikites, elle devait se faire sans utilisation d’un mushaf selon le fondateur de l’école. Par la suite, et bien que notre documentation à ce propos soit beaucoup plus pauvre que celle dont nous disposons pour l’Egypte mamelouke, il semble bien que des rituels de lecture aient été organisés autour de manuscrits coraniques déposés en waqf dans les mosquées du Maghreb. Les corans maghrébins en 30 volumes sont certes proportionnellement moins nombreux que ceux que l’on connaît en Orient, mais ils ne sont pas l’indispensable accompagnement de ces pratiques puisque, on le verra, certaines de ces dernières reposent sur l’ancienne division du Coran en sept parties. Dans le recueil d’al- Wansharïsï, deux juristes évoquent des hazzâbùn, autrement dit des lecteurs de hizb qui interviennent dans des grandes mosquées; les deux textes correspondent à des décisions prises au IXe/XVe siècle, dans un cas à Tlemcen, dans l’autre à Fès, signe du succès de ce type de pratique probablement imitée de l’Orient. Il est à noter que, dans la première, la distinction est faite entre le qâri’, «lecteur» sans doute spécialiste en questions de récitation et de variantes, et les hazzâbùn à qui est sans doute confiée la charge de lire/réciter une section précise du Coran. Les chroniqueurs de la période médiévale évoquent la fondation par des souverains de lectures publiques : à Tunis, dans la grande mosquée al-Zaytûna, le hafside Abu l-‘Abbâs Ahmad (règne de 772/1394 à 796/1394) institua une lecture quotidienne des sept parties du Coran. En 868/1463, un coran de grande taille fut rapporté d’Espagne à Tunis et quatre lecteurs furent nommés l’année suivante par le sultan Abu ‘Umar ‘Uthmân et devaient s’acquitter de leurs fonctions après les prières de l’aube, de midi et de l’après-midi. Dans la grande mosquée Qarawiyyïn de Fès, l’halmohade Yûsuf b. ‘Abd al-Mu’min (règne de 558/1163 à 580/1184) décida de rémunérer des lecteurs qui intervenaient après les prières de subh (aube) et de maghrib (coucher du soleil) ; selon al-Jaznâ’ï, il aurait même étendu cette mesure à tout son empire. Une décision analogue aurait été prise par le sultan mérinide Abu 1-Hasan ‘Alï Ier (règne de 732/1331 à 749/1348) qui prévoyait de verser une rétribution (jamf) à dix lecteurs dans chacune des mosquées de ses états. La lecture publique édifiante dans les mosquées du Maghreb médiéval touchait d’ailleurs un éventail de textes plus large que le Coran. 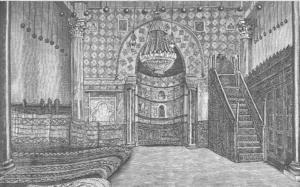 À Fès, d’après une fatwa du IXe/XVe siècle, la grande mosquée de Fâs al-Jadïd disposait d’un lecteur d’ouvrages non précisés (qarï al-kutub), mais sans doute de contenu religieux, à côté des hazzâbùn. À Tunis, ce sont le Jâmï al-sahïh de Bukhâri, le Kitâb al-Shifâ ft ta ‘rif huqùq al-mustafâ du Qâdï ‘Iyâd et le Kitâb al-Targhfb wa-l-tarhfb de ‘Abd al-‘Azïm al-Mundirï qui étaient lus dans la mosquée al-Zaytûna par suite d’une fondation d’Abû Fâris ‘Abd al-‘Azïz, alors qu’à Fès, à l’époque mérinide, il s’agissait d’œuvres édifiantes qui faisaient suite au hizb du Coran et rencontrèrent un tel succès que le sultan institua une rémunération pour le lecteur de ces textes.